AmSafe Bridport > News, Media & Events > Cargo > NH90 and Chinook Helicopter Contract Win! NH90 and Chinook Helicopter Contract Win! AmSafe Bridport wins two contracts from the Netherlands Defence Materiel Organisation (DMO) for the development and supply of internal cargo restraint nets for their NH90 and Chinook helicopters. Bridport, UK, March 2016: following a tender process AmSafe Bridport Limited has been awarded two contracts from the Netherlands DMO for the development and supply of internal cargo restraint nets for their NH90 and Chinook (CH-47) helicopters. AmSafe Bridport (ASB) will utilise their extensive expertise in engineered textile restraint to fulfil the requirements of the Netherlands DMO. The Netherlands DMO already use a number of ASB products; both Cargo Pallet Nets and HUSLE (Helicopter Under-Slung Load Equipment) Nets, ASB’s pedigree in these existing products helped them when responding to the Netherlands DMO RFI (summer 2015) and the later RFQ (late 2015). It was ASB’s in-depth knowledge of cargo restraint and textiles that allowed them to propose solutions to the new demands the Netherlands DMO have for cargo restraint within their NH90 and Chinook helicopters. The contracts involve the design, development and supply of 1 Net design for the NH90 and 3 Net designs for the Chinook. 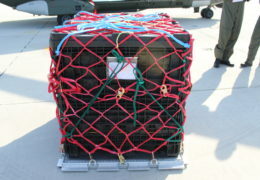 The NH90 Net is a Throw-over Net, and the Chinook Nets are; a Throw-over Net and 2 pre-formed (3-dimensional) Nets that fit over a pallet/load assembly. All 4 Nets attach to the floor attachment points within the helicopters. The Netherlands DMO and ASB are undertaking the contracts over the coming months with a PDR in March, a CDR in May and delivery of the production volume Nets before the end of 2016. “Helicopter internal restraint of cargo is a vital element of airworthiness, the cargo’s securement is vital to weight and balance and we are delighted to be working with the Netherlands DMO to ensure they have the right products to accomplish this safety critical aspect for both their NH90 and Chinook fleet of helicopter” – said Joe Ashton, Cargo Business Unit Manager for AmSafe Bridport.